Villa Arcanda D: A characteristic and welcoming apartment, with Free WI-FI. Property 85: Villa Arcanda D: A characteristic and welcoming apartment, with Free WI-FI. Villa Arcanda A: A cozy and welcoming apartment, with Free WI-FI. Property 86: Villa Arcanda A: A cozy and welcoming apartment, with Free WI-FI. Villa Luciano is a very spectacular villa. The building dates back to 1560, the furniture and all the details in the house are just breathtaking. So is the view towards Arezzo valley, even better than in the photos! Upon arrival we couldn't believe that there are 37 curves on a hilly road before reaching the villa but we got used to it. It gives a very remote feeling though there are some other houses nearby (the only thing we heard was some remote barking on one evening). We spoke in Italian with Luciano who is such a nice and warm gentelman, very helpful and also creative (hints inside the house). He gave the key and provided us with instructions. We enjoyed the jacuzzi and also some refreshing swim in the pool. When watching TV, there are two different digital boxes for the channels (for Germans and for the others, Italian channels included). The beds are comfortable, having shower in the bigger bathroom is slightly easier but we managed everything. There is even a little gym if you feel the need :) Also a place for cooking your own pizza. Unfortunately we didn't have the time to enjoy playing billiard but the room seemed very appealing for that. We absolutely loved our stay and we would definately return for the next trip to discover some others of the numerous treasures in Tuscany area! The view from our apartment looked over the valley and hills with amazing sunsets. Our one bedroom apartment was spacious and comfortable with a large terrace where we ate all of our meals and enjoyed the view and sunsets. Our hosts were friendly and very helpful with advice on sites, restaurants and shops. The road up is steep and twisty but well worth it. 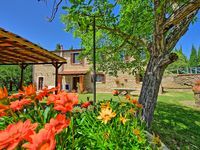 The location is only about 20 minutes from Cortona and Arezzo. You can walk out the door and a good hike to the mountain top with an excellent lookout over three valleys. A great place to spend a week in Tuscany . . . we spent two weeks!